Comments, questions, or suggestions? Email Kristin McCarthy at kmccarthy@fmep.org. Israeli Defense Minister Avigdor Liberman announced on October 11th that he expects the Israeli Cabinet to move to expedite plans to build 31 new settlement units on Shuhada Street in the heart of downtown Hebron. The units, which would be the first new construction in Hebron to be approved in 16 years, would create a new settler enclave in the city (in effect, a new urban settlement, not connected to already existing settlements in the city). The Israeli Civil Administration approved a building permit for the 31 units in October 2017, but did so conditionally. One condition was that the Palestinian municipality of Hebron and others would have the opportunity to file objections to the plan. Soon after, two appeals were filed with the Defense Ministry: one by the Palestinian municipality of Hebron and one by the Israeli settlement watchdog Peace Now. This week, in response to Liberman’s announcement and potential Cabinet-level involvement in the plan, the Israeli Defense Ministry said that “a decision will be released soon” on the petitions. Peace Now said that if the Defense Ministry rejects its appeal, it will file a petition with the High Court of Justice. The legal objections to the plan stem from the problematic process by which Israel made land in downtown Hebron available for settlement construction. Located in the Israeli-controlled H-2 area of Hebron (where 500 Israeli settlers live amongst 40,000 Palestinians), the land was seized in the 1980s from the Hebron Municipality by Israel for military use. In 2007, the Civil Administration’s Legal Advisor issued an opinion stating that once Israel is done using the land for military purposes, it must be returned to the Hebron Municipality, which has protected tenancy rights to the land. Nonetheless, in 2015, the Israeli Civil Administration, with the consent of the Minister of Defense, quietly authorized the Housing Ministry to plan the area, paving the way for that same ministry to subsequently present the plan for 31 units. The Cabinet might decide to take up the plan as soon as October 14th, during its next weekly meeting. Liberman’s move this week to involve the Cabinet is an attempt to expedite and coordinate the implementation of the plan, which requires funding from several ministries. It might also be an effort to put a thumb on the scale against petitions that have stalled (and may continue to stall) the plan’s implementation. The radical Ateret Cohanim settler organization managed to purchase a house in an incredibly sensitive and inflammatory location inside the Muslim Quarter of the Old City of Jerusalem, only 100 meters from the Dome of the Rock/al-Haram al-Sharif. Settlers moved into the house this week and have already begun renovating the property. Some reports blamed infighting between Palestinian Authority President Mahmoud Abbas and political rival Mohammed Dahlan for the sale to the settlers. The settlers gained control of the house, which was owned by a prestigious Palestinian family for decades, after the Palestinians sold it to a middleman, who then sold it for $17 million to Ateret Cohanim. News of the sale of the home to settlers has reverberated within the Palestinian body politic, engendering intense public outrage directed at Palestinian Authority officials who are believed to have been involved in killing the sale of the house to a Palestinian American with ties to Dahlan, and at others who vouched for the credibility of a middleman who eventually sold the house to settlers. Internal politics notwithstanding, the fact of the matter is that the sale only advances Israeli settlers’ and Temple Mount activists’ ongoing efforts to undermine and change the status quo in the Old City and on the Temple Mount. Israeli provocations on and around the Temple Mount have proven to be (and continue to be) a volatile flashpoint for the outbreak of widespread violence. New details have emerged regarding the Silwan house that settlers moved into last week, having previously purchased it from its Palestinian owners (covered by FMEP last week). 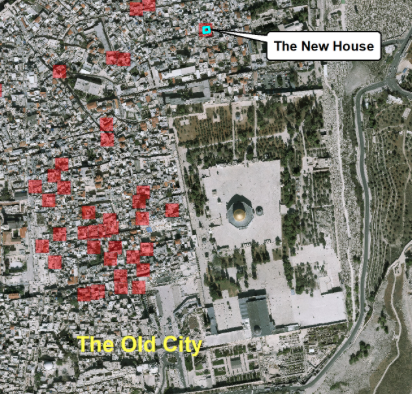 According to new Peace Now reporting, the significance of the property goes beyond its location in the Palestinian East Jerusalem neighborhood of Silwan (a site of concentrated and aggressive settlement activity). The house’s precise location sits on top of a massive and controversial underground archaeological excavation led by the Israel Antiquities Authority under the direction of the radical Elad settler organization. Elad is dedicated to increasing a Jewish presence in East Jerusalem neighborhoods at the expense of current and historical Palestinian connections. After months of pressure from senior government officials, this week the head of the Israeli Defense Forces agreed to allow the government to directly apply two Israeli laws over the West Bank settlements. One law, allowing settlers to share their egg quotas with farmers in Israeli proper, was passed by the Knesset in June 2018. The second law, regulating the production and sale of organic produce, was passed in 2005. As FMEP has extensively documented (see Table #3 in red), this is just the latest in a string of moves over the past 2+ years by which the Knesset and Israeli government has begun institutionalizing the application of Israeli domestic law over areas of Israeli settlement outside of its borders, amounting to a process of de facto annexation. . The Israeli Minister of Social Equality, Gila Gamliel, has allocated 1.5 million shekels ($413,000 USD) to a film project that will glorify the history of the settlement movement and the personal stories of leading settlement figures. The project will be a governmental collaboration with the Menachem Begin Heritage Center and the Yesha Council – an umbrella group representing all settlements in the West Bank; both organizations will appoint representatives to the steering committee for the project. Contrary to the claims of those backing the project, the history and personal stories of leading figures of the settlement movement have been extensively documented – most epically by Akiva Eldar in “Lords of the Land: The War Over Israel’s Settlements in the Occupied Territories 1967-2007.” Eldar’s historical accounting of early settlers unveils the reality that most early settlers were knowingly and deliberately breaking Israeli law by building without government permits and directly undermining Israeli government policies. Another superb book, Dear Brothers: the West Bank Jewish Underground, by Haggai Segal (now a prominent right-wing Israeli journalist), provides first-hand documentation and testimony regarding a critical chapter in the settlement movement: the 1980s Jewish Underground, which among other things carried out and celebrated a series of terrorist attacks against Palestinian mayors and planned to blow up the Dome of the Rock. This new film project, on the other hand, promises to be a piece of propaganda designed to sanitize and mythologize these same people and events. In response to the heinous murder of Israeli employees by a Palestinian worker at the Barkan Industrial Zone (a settlement industrial zone located deep inside the West Bank, near the Ariel settlement), U.S. Ambassador to Israel described Barkan as a “model of Israeli-Palestinian coexistence since 1982, with thousands working and prospering together.” The reality of West Bank industrial zones, and the role they play in the lives of Palestinians, is, in fact, more complicated. For decades Israel has used industrial zones as another tool to expand and deepen control over West Bank land, and jobs in industrial zones – often the only jobs available for Palestinians living under an Israeli occupation that prevents the development of any normal Palestinian economy – are widely viewed by Palestinians as a double-edged sword.